Wild animals have never been so stylish! Bring the excitement of a super safari - with a touch of whimsy - right to your walls with this Waverly Animal Crackers Wall Art wall decals set. 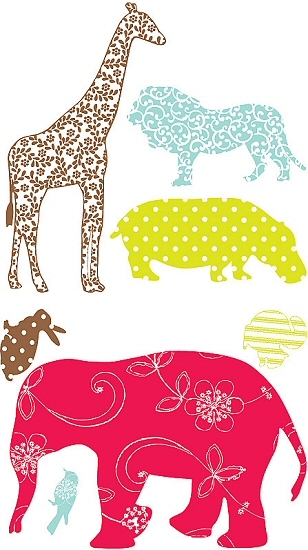 Fun and easy to use, this set of peel and stick Waverly Animal Crackers wall decals features colorful safari animals with whimsical patterned bodies including an elephant, giraffe, squirrel, lion, bunny, bird, and hippo. Perfect for bedrooms, playrooms and even classrooms. Wallies Waverly Animal Crackers Wall Art wall decals let children be the decorators of their own domains and have great fun while they're at it. No water, no mess, just peel the wall stickers off the backing and stick them to the wall to bring whimsical decor into your home in minutes. 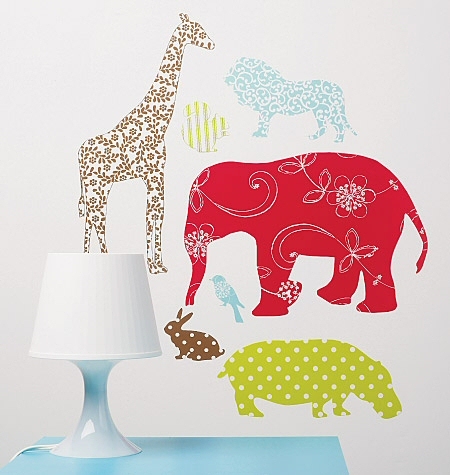 Made of durable, self-adhesive backed vinyl that can be removed and repositioned easily, this peel and stick Waverly Animal Crackers Wall Art wall decals set will not harm or damage surfaces or leave a sticky residue. 2" x 4" to 20.5" x 10"